This Pearl Orchids Flower Print Artwork is printed at high resolution with vivid color on water-proof canvas to create the look and feel of the original nature and masterpiece. Overall size: 40"x20" (8x12in x2 pcs, 8x16in x2 pcs, 8x20in x1 pc), Total 5 pcs / a set. The image is just for displaying not for scale, pls measure your place before purchase. Vibrant Flowers Pearl Orchids Canvas Print Wall Art Giclee Artwork, HD pictures photo printed on canvas. Home decorations for living room, bedroom, office, bathroom, kitchen, hotel, bar etc. A perfect gift for your relatives and friends. 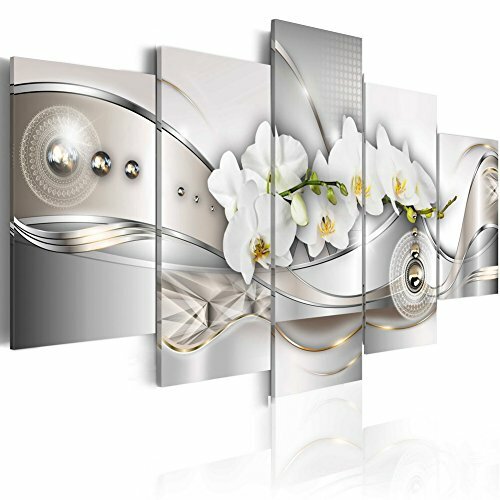 Good for wall decor, this contemporary Crystal Butterfly Orchid floral painting will light up your room.